This peak is unnamed on the OSI Discovery map, surely one of the highest peaks to lack a name. The name Corranabinnnia is found in walking guides. It is also named Cushcamcarragh (from Ir. Coiscéim Charrach, 'rocky step') in atlases. This name also appears on Bald's map of Mayo (1830), while the name Curranabinna is applied to the cirque north of the peak. Walks: for a route taking in Bengorm, Corranabinnia and Glennamong, see Whilde & Simms, New Irish Walk Guide - West and North, 72-73. 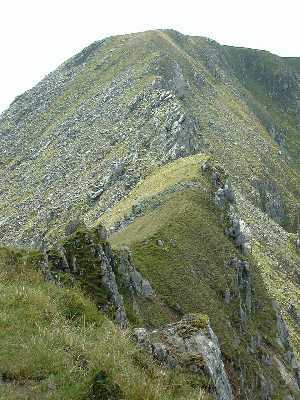 Corranabinnia is the third highest mountain in the North Mayo area and the 101st highest in Ireland. Corranabinnia is situated at the northern end of the Glendahurk valley and is the apex and the highest point of the Glendahurk Horseshoe. It's a highly rated peak, particularly noted for the fine ridge which extends south west from its summit to that of its SW top. There are staggering views of Clew Bay on a good day. 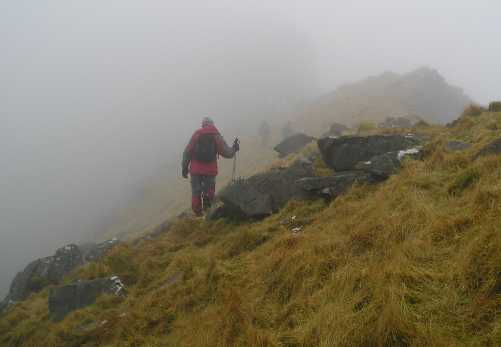 Corranabinnia is remote from roads and consequently there are a relatively small number of practical routes and these all involve other peaks. The most obvious is the circuit of Glendahurk Valley, taking in Bengorm, its NW top and the 2 Corranabinnias and making use of the raking spur south of Corranabinnia SW top. The horseshoe can be done in either direction, from starting points at either L91061 97962 A or about 300m further south, where there is a stile on the right. At 15k with an ascent of c.1,000m, the circuit should take about 6 hours. 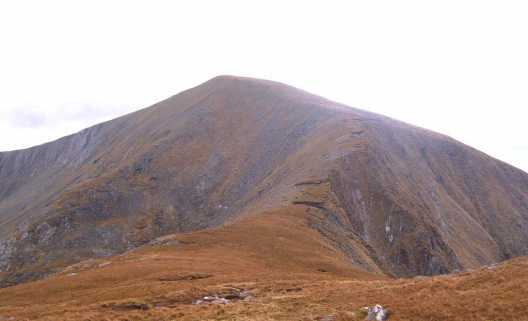 This summit ,while 5 metres lower than than the highest in the range,remote Slieve Car, is the high point of the western Nephinbeg ridge. It commands splendid views, particularly south over Clew Bay and west toward Achill (lower photo) It also forms part of a fine 20km. ridge circuit including BenGorm and Glenamong. A MountainViews walk took place on Saturday 7th October. It was led by MountainViews member Liz50, and 17 hardy souls set off on this tough and demanding walk. We completed a counter-clockwise loop of the Glendahurk circuit in the Nephin Begs. Two members planned to join us as far as Ben Gorm NW Top, and the remaining 15 continued on the full circuit. From L91061 97962 A we started with a bog walk to Ben Gorm (582m). This early ascent of over 530m over tiring bog meant that (A) we got this nasty slog out of the way early, (B) we could approach the infamous Corranabinnia arête later from a more favourable NE-SW direction. 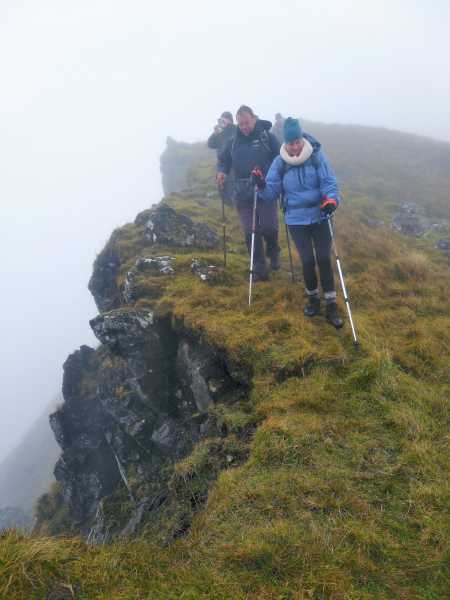 Given the cloudy and sometimes wet conditions, and mix of ability amongst the group, it was a wise decision by the experienced Liz50 who has traversed the arête from both directions previously and understood the best approach for our group. After Ben Gorm we dropped 230m to the col and ascended over 110m to Ben Gorm NW Top. 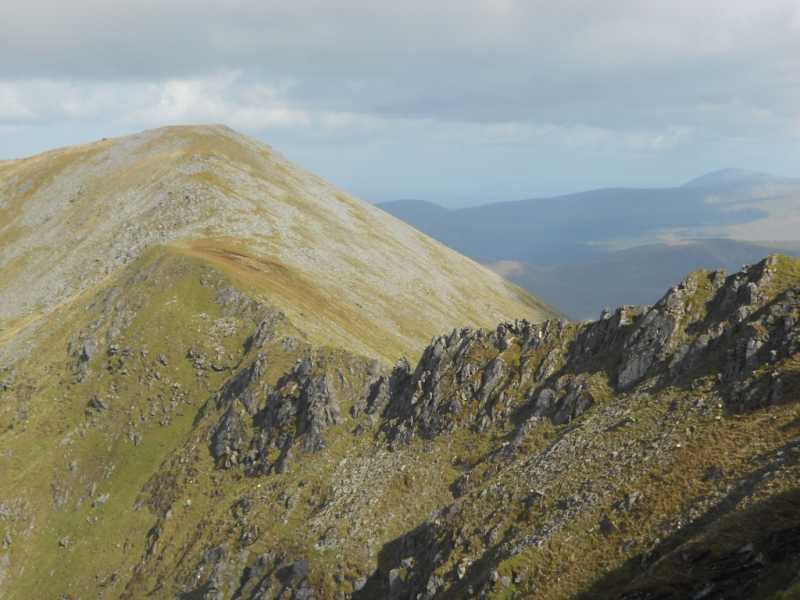 Looking back at Ben Gorm from Ben Gorm NW gave another reason to be glad of the counter clockwise route – imagine facing that 230m haul up Ben Gorm towards the end of a clockwise walk?! The 300m climb from the col below Ben Gorm NW up to the main Corranabinnia summit was demanding and included some light scrambling over some steep rocky ground. The infamous views were denied to us by cloud but the delicious home-made chocolate and oatmeal treats being passed around kept us otherwise engaged! With approx. 950m of accumulated ascent so far under our boots we knew that the majority of the climbing was done but that the section requiring most concentration lay ahead. Liz50 ably navigated us down towards the arête. It suddenly appeared as the ground gave way on the right to sheer and craggy drops that disappeared into the mist below. The ground to the left (south side) fell away steeply in a tumble of rocks and steep grassy slopes. Liz50 brought us along a narrow route on the southern side several metres safely below the jagged and brooding arête. While protected from the worst of the exposure, concentration was needed as we delicately clambered over and around rocks and focussed on not slipping on the wet ground. Time momentarily took on a different speed as it was all about one slow foot and handhold in front of the other. Eventually we reached a place where a scramble up a very steep grassy slope took us suddenly onto the summit area of Corranabinnia SW. Despite the cloud we had seen enough of the arête to appreciate its challenge, and to feel a sense of achievement having completed the crossing.